THIS PARTY IS NOW SOLD OUT!!! WE ARE DIRECTING EVERYONE TO OUR OTHER 20+ PARTIES IN THE CITY INCLUDING THE BELLEVUE, HILTON PENN'S LANDING, CITY TAP HOUSE, and LUCKY STRIKE HERE: https://www.NewYearsEveTickets.com/philadelphia NO MORE TICKETS WILL BE RELEASED FOR THIS PARTY AND NO TICKETS WILL BE SOLD AT THE DOOR. See you & your friends there! Be sure to "Like" & "Share" above to help spread the word!! This ticket gets you a 6-hour open bar from 8pm to 2am, full buffet, hat & horns, fireworks view, and more! This ticket gets you an open bar from 8pm to 2am with a guaranteed place to sit. Must have 4 people minimum in party. VERY LIMITED AVAILABILITY. This ticket gets you an open bar from 8pm to 2am. Discounted price - VERY LIMITED! 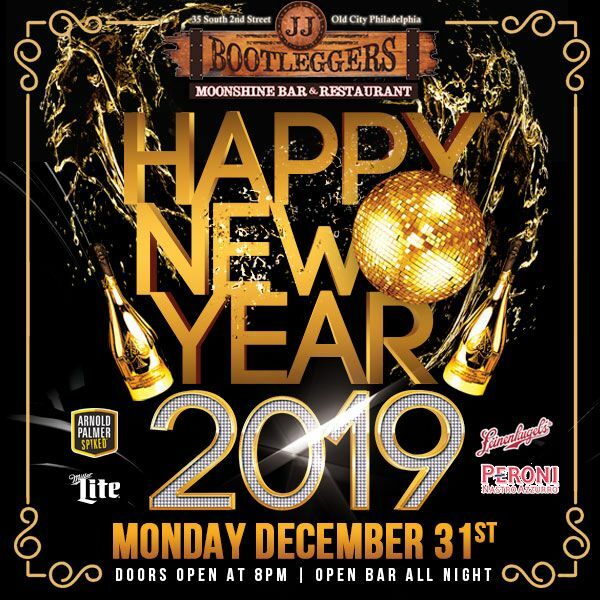 Celebrate NYE 2019 with FIREWORKS over the River and the Best Party in Old City at JJ Bootleggers. Bring your significant other or find somebody new to kiss at Midnight! Our Best of Philly DJ will be spinning all your favorite tunes from open to close! Doors Open at 8pm, Open Bar all night! Premium Dinner Buffet with all your Bootlegger's favorites! EVERYONE MUST BE 21 or older with PROPER Identification. THIS EVENT WILL SELL OUT IN ADVANCE OF NYE - BUY TICKETS NOW!!! No Refunds after purchase. Ticket Prices WILL increase as ticket availability decreases. View More Events Organized by JJ Bootleggers. Moonshine specialist serving American fare & a boozy brunch in a woodsy space with a saloon feel. This event is organized by JJ Bootleggers.